Victor is one of the boys who hangs out around our house every day. We now have two regulars: Victor and Isaac (aka the Camo Kid). The two are friends and both come by each afternoon to hang out. They will sit and watch a movie if one is on, will play with the tennis ball or any of the toys we have. Each of us have taken a personal liking to one. Victor is my favorite, and I have no problem saying that. His is 6 years old and in class one. Since he is here all the time, I figured that it was about time to give you all an introduction. The picture was taken today as we were waiting out the rain. He was caught here when the rain started, so I let him hang out with Sue and I to keep dry. When the rain slowed down, he dashed out and returned with a coat. Hence the picture. The group of girls who used to bother us have moved on, now we have a following of boys. Every day there are a few that stop by to say hello or play in our courtyard. We have no problem letting them play as long as they do not bother us. If we are watching a movie, some with trickle in and sit down quietly to watch along. Of course they like action best because they do not know English well enough to follow a plot that does not have a little action. James Bond seems to be a favorite. They all enjoyed watching Diamonds are Forever when Connery is driving a moon vehicle in Vegas. In addition, they have been our Swahili tutors. We will ask them questions about what different things are called and they will respond. In return, we have been teaching them a few new English words. They do not remember much and neither do we, but it is good to have practice with our Swahili. To ask them to do something or play elsewhere, we must use the little Swahili we know. I can't help but think how this whole relationship between us and the boys would not be allowed in the United States. I am not advocating spending all my time with children, but it is sad to think that this would not be allowed. Accusations would be launched, whispers in town, awkward looks at the grocery store. There are a lot more freedoms in this country that cannot be enjoyed at home. We may have a better system of laws, but overprotection has overridden what used to be a childhood. Could you imagine the comments that would stir if a parent allowed his or her 4 year old child to walk into town alone and go to school? Here it is commonplace. Young children walk in groups. Some barely above the age of crawling. Kids go about town as they want. I do not find it to be something to glorify, rather different. My thoughts on the matter are far from completely formed. However, I will argue that a certain amount of freedom in children is positive. Having taught last year, I had to be mindful of the situations I was in at all times. I drove children home but had to ensure that they were in the back to prevent a possible problem. I had to keep my door open when talking to students, particularly girls. All sensible considering the consequences of a misunderstood comment or action, but a sad way to work. Often I would feel anxious in situations that I knew could go wrong when I knew that there was no reason for this emotion. Here I do not even have to consider it. Children come by and say hello. They sit in our courtyard and watch me as I wash the dishes. No big deal. Today, Sue and I shook the hands of numerous children outside the SJC. They jumped and danced around when we would wave back to them. The ability to bring joy to a child by just shaking his or her hand is humbling. Children will laugh if we goof around as they pass by. If I did that in the middle of Boston I would probably be chased off. I'm rambling, so I will put it to an end here. Being that it is Jean's birthday today, we made a little outing of the day. Jean, Sue and I all went to Webuye falls to see some waterfalls and then met up in town with Michael for lunch. We had been told that the falls were a worthwhile trip. Jean wanted to go for her birthday and Sue and I obliged her request. At about 10:30, we set off on a matatu heading north to Webuye. I had only been as far as the Malava forest before, so it was nice to take a trip further up country and see what the rest of the Western Province has to offer. One difference is the quality of roads. Once we hit a T, we turned unto a smooth road with not only lines to mark the middle, but solid lines on the sides. The matatu clipped along at a solid 80kph to Webuye. In town we hired a bodaboda (bike taxi) for each of us. A great idea because it saved us a lot of time, which we learned when we tried to walk back and it took an hour. Riding on the back of a bike is strange and it took me a few minutes to get used to the idea that it was in fact a taxi. I was not concerned about falling, but it was strange to be on the back of bicycle. I could have rode a pickypicky (motorcycle) but decided against it due to the price. We were left off at the bottom of a hill. The men said to walk up and follow the path to the falls. Unfortunately, the top had a fork and we did not know if we should take it. As we approached the fork, Jean turned and said, "It's there." I followed her finger and saw what is pictured beside. The falls were straight ahead, but required a bit of work to make the descent to the base and the climb to the top. I figured that since a straight line is the shortest distance between two points, that the obvious thing to do would be to walk straight at the falls. It turns out that it was a steep decent to make it to the foot of the falls, but a bit of sliding and jumping helped us make it down. We hoped to cross the middle and make it to the right half, but were unable to find a passable route over the water. We continued upwards and to the left of the falls with the goal of finding a set of rocks or a narrow stretch of water. We found no such part, but did make it to a smaller section of the falls with a grassy field (as seen on the left). Being that it was a hot day and that the water was running swiftly due to rushing water above and below, we jumped in for a dip. I am not sure if this was the smartest decision I have made in Kenya thus far, but it sure was nice to go for a swim. Summer for the past three months and I have only seen a swimming pool. It is just not right to waste an opportunity to go for a swim when the temperature is as hot as it was today. I was emboldened by the rushing water, but I still know that there could have been bacteria or whatever swimming around with me. Time will reveal the prudence of this decision. We dried off, hung out with some cows and children and then walked back to town. Then it was time to lunch to be enjoyed while it was raining. So far, I am never disappointed to see rain. In fact it makes me happy whenever it rains. Our rain tank went empty again this morning, a little rain today has restored it to working order, but we are far from in good shape. The drought continues and rain is a necessity. Michael cooking on our grill when we had no gas. Hamburgers, green peppers and onions. Picture taken of the side of a building in Webuye, I think it is a funny picture. Harry Potter graduates from Hogwarts and rides his pen home. Leptoptilos crumeniferus W 260cm L 150cm Very large. Flies with retracted head and neck (unlike other storks). Habitat: dry areas including towns where it can feed on fish, small and young animals, carrion and refuse. Taken in Kakamega today on a 2mp camera phone. It was hot today and it just increases with each day. There is no point in ever checking the weather here. The morning is comfortable as the sun is rising. You can wear shorts and a hoodie and feel relaxed making your way around. Once the sun hits, the heat begins. Like a slow building ant hill, the heat grows. One moment there are a few specks of dirt around a hole, look away and then a hill. Get on with things and the hill has grown to a mound with a colony running about collecting dirt and food to grow the nest. That is the heat. By mid-day it was hot everywhere. My house has been a usual escape, but did not provide much aid. Shade is always a good thing, but dead air on a clear blistering day can be brutal. I am convinced more and more that the rainy season is really a misnomer for the sunny season. It continues to get hotter without any promise of relenting. I want to start with this because it frames my day and informs the way that I viewed everything that transpired. With a parent meeting on the docket, I had my best commute of the year: the house in my backyard. I waited around until Neto showed up and then began to bring over all the supplies that had been piled into the house yesterday. The parents arrived, Grace kicked things off, I introduced myself and the meeting went on. I did not pay much attention because it was conducted in Swahili. It gave me a good chance to read some of the New Yorker and Sports Illustrated. Tea break meant that it was time for Sue and I to spring into action and take down registration. After the flurry and a few cups of chai, we retreated to my house to escape the hot building and spare ourselves from hearing a lecture about Malaria in a language we did not understand. Jean came back, the meeting ended, packed up, unpacked at the center and cruised the market. I returned home to hang out and got a phone call at about 3 from Judi asking me to come over to the house. The work I did yesterday had a problem. It turned out that I entered a set of the data in the wrong account. I made the correction by changing the heading on each of the individual entries, then double checked to make sure that I was really done. By the way, I had to walk back and forth in the heat. It actually was not all that bad, but left me in want of liquid. Shortly after I arrived home and hydrated, Michael arrived. We went up to have come chicken at the petrol station for dinner and returned home to watch Bond movies. So, as I leave you tonight we begin Casino Royal. Goodnight. Feeling better, I went about my usual Thursday morning at the Honey Drop with the Masai. I ate my mandazi, drank chai and went to work. Sue and I hung out in the office, checked over the books and chatted as the few kids played. Joy arrived at about 9:30 and sat down. "The President is coming to town today. Did you see the people getting ready?" With that a day that was intended to be relaxing was kicked into gear. She said that he would be arriving at 11 to speak for a half hour. With no camera, I dashed home to collect my camera and camcorder to record the events. Walking over, I called Michael and told him to get off work and get back to town as quickly as possibly. Five minutes later I was at the SJC and Michael was out of the school. with her to do the financial reports for February. We had been delayed for a few weeks due to accounting issues but I was finally given the go and she needed it done by the end of today. Upset at the possibility of missing the occasion, I tried to come up with a way to work around the issue. Fortunately, Joy offered to give me a ride back after the event. However, she would call her policeman friend to ask when the President would be arriving. my best to hide it. By 1:15 we were done and sitting in the house. A bathroom break and a walk uptown put us at the scene before 1:40. The hot sun forced the girls to shade and Michael and I to soda refreshments. Two men were performing, one on a single string violin and the other on a tin pan drum set. The crowd was multiplying around and we thought it would be worth checking out. Immediately, the man saw us and began to sing about us being there. The crowd had a few laughs and more came to see not the performer but the mzungus. Soon they were all gathered around us as if we were the performers. Eyes fixed upon our shiny whiteness baking in the sun, made all of us uncomfortable. We stepped away only to be followed by the two men who wanted to introduce themselves to us. They are featured first in the video and the man's smile is hard to miss in the pictures. Drinks completed and the time upon us, we jostled our way to get ready. The police began to move everyone across the street from where the President would be speaking and kept all off the road. Being tall we were at an advantage, but we were becoming uncomfortably friendly with our neighbors. Then it was time to wait. We waited and waited and waited. My legs were starting to cramp up. It felt as if all the blood had run downward and left the top to crisp in UV rays. Behind my knees was a filling wrench of solid from the ceasing of flow. I had to march in place and rock back and forth to keep circulation going and not go crazy. As we waited, the police lined the street in front. With all sort of variations on blue, white, green and tan, the soldiers stood and chatted. There was at least one every yard of pavement from the top of town to the bottom. The crowd stretched down the tarmac like a fairway for Tiger Woods. We were lucky to be in the action at the tee box area, but hundreds of yards down people waited with the hopes of catching a glimpse of the president. Behind, people hung from buildings, stood on bikes, leaned on poles, ascended trees, and huddled under the shade. One police officer came over to say hello, and pulled me onto the road. He whispered and said that the female officers found both Michael and I very attractive and he would be glad to pass on our numbers. I laughed and said we were flattered to hear, but would not be giving up our phone numbers. I returned back to the masses and waited. Being that there is a drought, the dust can be nasty. Today was windy and the fire department had the solution. Water the barren soil. People have empty wells, no drinking water, no water for plants, some are starving, but spray they did. I saw them do two treatments and Joy saw one earlier this morning. Water put to good use. In addition, the President needs a red carpet whenever he goes anywhere. Only the most regal of accommodations can be had. Also, the carpet must not be dusty. So have a young boy dust it every few minutes to prevent the President from getting too much dirt on the bottom of his does. That would not be good, not at all. Then, a siren sounded the parade of cars that was to follow as a police motorcycle ripped past. Shortly after, a few SUV's kicked up dust as a group of black Mercedes Benzs slowed down. From the second emerged a fat man with a white shirt and no jacket. He hobbled along, clearly overheated after riding a helicopter and sitting in an air conditioned car. Not terribly tall, the president looked much like the villain the people here make him out to be. He was introduced, and spoke for a whole five minutes. From what I am told he said nothing. He spoke with a slow Swahili that was both political and age-bearing. His speech was not careful and he had to check his notes as he spoke. A few jokes/remarks brought about laughter, but he did not bring forth any feeling of national unity. For a man who is the President of a country, he was an under-whelming figure. After he left, it was the Agricultural Minister William Ruto who had greater applause when he simply stopped and rolled down his window. The people called out his name and cheered. Kikaki did not thank the people for coming to see him. He said he had to go and had to be convinced to speak more. His response was that he promised nothing and had to go to Kakamega. So off he went in a hurry to his next destination. There were no handshakes, all business. He was attempting to rebuild his image in an area that has not been supportive of his administration and he failed miserably. His visit left people more angry with him and his actions. Kenya has mobilised 3,500 security personnel to fight a series of bush fires raging out of control in some of the country's most important forests. The government estimates that more than 4,600 hectares (11,370 acres) of bushland have already been destroyed. At least 10 people have been arrested on arson charges. Mau - East Africa's largest forest - and Mount Longonot are among the places worst affected. Some of the world's most endangered species are threatened. 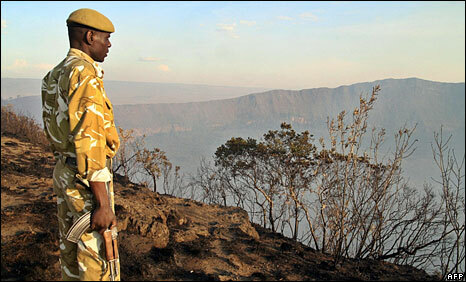 With fires burning in at least eight forests, Kenyan emergency services are already overstretched. Police, the national youth service, forestry service workers - all have been drafted in to help save the bushland in some of the country's most important watersheds. On Mount Longonot, an extinct volcano to the west of the country, the fires have begun advancing into the crater, trapping and killing thousands of small animals unable to escape. Some larger antelope have managed to get away but they now face starvation in grasslands already overgrazed in a prolonged drought. Several rare sitatunga antelope have already been killed in another park. Although it will take time to assess the impact on wildlife, a spokesman for the Kenyan Wildlife Service said there were real fears for rare and endangered species. He said at least 10 people were under arrest charged with arson, although honey-gatherers lighting fires to smoke out bee hives and charcoal burners might also be to blame. Yes it is true and not a joke and I am fine. It is the reason I did not have a post for yesterday (first time all trip). Yesterday morning I got onto my usual Sunday routine. I cleaned and began to cook the ribs that were to be for dinner. Since we have no oven, I had to start early to boil them. I made a quick egg breakfast and began to boil at around 9am. I continued for 4 hours and then threw around the tennis ball with some of the boys. It felt great to be in the sun tossing around a ball like it was summer baseball. Tired from the sun and running around, I retreated into the house to watch a movie with Michael, Sue and the boys. We watched Shrek 2 and 3 as I rested in the chair. I felt a bit tired, but that was natural due to the running around and sun. At 4pm it was time to grill the ribs that had been marinating in my bbq sauce. Another hour of cooking and the ribs were all done. After finishing I was hit by a wave of nausea and exhaustion. I sat down for a bit because I started to feel as if I might get sick. After a few minutes, I moved to a reclined position. I began to feel better and soon attempted to walk around. No good. Again I felt very sick and more tired. I thought of going to bed right away, despite being before 6pm and skipping a shower. Instead, I opted for the shower, but shortly after I gave up and went to bed. I was in bed at around 6pm and had chills as I fell asleep. I woke up a few times feeling very hot, but returned to my dreams quickly. The sleep was good and when I woke up at about 7am this morning I was feeling a little better. I was still groggy, but that has occurred before. Since I only ate eggs yesterday, I forced myself to sit down for a 'big' breakfast. I shoveled down one and a half mandazis at the honey drop when I was only hungry for a few bites. At work, I still felt a bit off and decided to take a trip to the hospital to sort out this mess. Sue gave me directions and I went up to wait. After twenty minutes of waiting, I got a call from Sr Joy. She told me to go to the maternity ward and look for a Dr. friend of hers. I did as ordered and was seen immediately. He listened to my symptoms and took me to get a blood smear. Twenty minutes later I was told that I had malaria. I was given meds and went home. For the afternoon I have been watching Denzel Washington movies and laying on the couch. I forced myself to have lunch and dinner because I need food to take the medicine, but I have no appetite. As for the sickness, it feels like a cross between the flu, mono and a hangover. My body has minor aches, head cloudy, stomach blah, and everything just a bit strange. It is very different, but not terrible. I hope to have kicked this bug in a few days. The good and bad thing is that the drugs to beat malaria are strong, so they will do a number on me and the virus. Fortunately, I will be fine but the malaria will not do so well. Do not worry, I am fine and will be fine. Sue, Michael and I headed over to the orphanage to do some painting. We threw down some primer and painted along for the afternoon. It was cathartic to do some mindless physical labor that was extremely simple. Before and after, Michael and I watched some of our new movies. A few of the boys who hang around here stood at the window to watch along. We had no problem because they did not talk and they stayed outside. After all this, we had an early dinner prepared by Jean and Sue. They cooked us a steak pizza that hit the spot. There really was not much to today. I think that I have truly settled into my weekend routine. I do not feel the need to have big plans or great adventures. Housework has been set aside for relaxation and painting. I am late and short today, but this will have to do. Sue and I went to grab a meal at the Honey Drop and ended up sitting with two of the Masaai. The place was crowded and we had no choice but to sit with the two. It was a slightly awkward meal, but an experience to say the least. I think she will be writing about it soon, so I will leave the descriptions to her blog. We hung around for a bit and then shot into Kakamega to meet up with Michael and Jean. They were changing their bus tickets and we were going for the food and the movies. After the success of Michael's two films, I wanted to gather a few more pirated movies from Kakamega. It turned out to be a resounding success. For $15 USD I now own over 60 new films. They include 28 007 movies and all the Rockys. Of course a stop for a chicken and chips lunch was necessary. We bought a few items at the store and shuttled home to watch our new movies. Once home, we put on a movie, put up our feet, and relaxed. Dinner was a PB&J sandwich because we are still without means to cook. I will check on gas tomorrow and fill the tank if possible. Since we cannot boil the water, I brought out my SteriPen and treated the filtered water. Hopefully it will take care of whatever bacteria that may have been in the water. We were running very short on water (down to about 2L) and needed to prepare water for drinking. I was surprised by a phone call from Sr. Sissy. It was nice to have a chat to someone stateside. Despite writing this daily, I forget that people know what is going on here. I am always confused when someone will reference an event mentioned here, but not elsewhere. I guess I still manage to detach myself from the public aspect of this when I write about my day and my various reflections. The weekend should be busy with home projects and other various tasks. Not too much to report for today overall. Happy weekend! I am going to skip the work part of today, because it was not much different than any other day. Sat with Sue and chatted while the babies were being seen by Angela and David. However, I will note that I had good fun teasing Neto throughout the day because of his teams loss. We shared a laugh when we read in the paper that people took to the streets in Mombasa to celebrate the loss of Man U. Needless to say, it was a big win for Liverpool and Chelsea. It must have been like in Boston any time the Yankees lose. I swear the Red Sox fans get more joy out of a Yankee loss than a Sox win, but that is my theory. When I got home it was time for serious work. I began by washing my corned beef. It had been sitting for over a week and was ready for tomorrow. I set it to boil and then began my next project: making pickles. We now have cucumbers and with my pickling of meat I wanted to try them out. I bought a large one, found a clean glass and looked up a recipe online. Right now cucumbers sit in a jar in our fridge pickling away. We did not have dill, so I had to make do with our spices. If they turn out to be decent, I will buy dill the next time I am in Kakamega and continue my pickle experiments. I tended to the corned beef, added more water and a glass of Guinness and waited. As it cooked I managed to wash the dishes and peel all of our carrots. Tomorrow I will make a stew with carrots, cabbage, potatoes, onions, corned beef and of course Guinness. By the time I was done all this, it was time for our lesson. I turned the stove down, learned some Swahili and checked the meat. After tasting it, I can say that I have produced a decent corned beef. I would like to try again with a slightly altered brine, but I consider this to be a solid first attempt. It was very easy to make and since I control the flavor, tastes the way that I want. Tomorrow will probably yield a late blog, due to the guests and festivities. Be patient, for I will reveal all the great things that will take place tomorrow. Michael, Sue and I met up with Angela to go to a more 'lively' church this morning. At 10am we met at the corner of Malava Juu (uptown) and walked to the service. We arrived shortly after it started. It was held in a large building filled with rows of pews. In the front, the pastor was giving his sermon to the small crowd. He stood behind what was a pseudo-alter. More like a podium with a blue cloth. Sitting in the front was a woman at a table with the same blue cloth on it and the chairs. To the right a keyboard and sound system. The pastor was giving his sermon with a microphone. The speakers were set in the back corners with, yup, blue cloths hanging over. For extra decoration, the speakers had large plastic flowers. Next to the podium stood two green plants with fake flowers draped. The pastor spoke in a slow Swahili, which was a nice change of pace from the Catholic church. After a few minutes, the woman seated at the blue table passed a note to the preacher. He read it and called for a translator. Immediately, a man came forward and the pastor switched to English. The other man took his own mic and began to translate into Swahili. He proceeded with his sermon in English and threw in a good amount of, "Praise the Lord[s]" to keep us all on our toes. As he preached, the congregation listened with great care as they took notes and checked their bibles. He came to the end of his sermon after about 30 or 45 minutes and kicked off into song. The initial keyboardist was inept and unable to come close to following the tune. My concerns were cast aside as the real player came in and joined. He threw on a beat and played the right chords for the songs. The pastor was accompanied by a group of female singers. They harmonized as he sang his praise. With the people up and the room filling, things got started. The real service was about to begin, and I did not even know it. He sang for a bit and then said his goodbye. I figured that it was a short day and that we got lucky. Not so much. One of the back up ladies took over and launched into song. As the song would progress, she would move away from the rest of the singers and cut loose into her own variants on the notes and words. Further along, as the song came to an end, she would launch into a spoken praise that would lead to rambling. Not wanting to be left out, everyone begins to speak out and call great praises to Jesus and God. Some drop to their knees, head against the floor in great reverence to their savior. Others looked upwards, arms raised as if pulled up by the holy spirit towards heaven. They would chant and ramble their thoughts and prayers in a swell much like the Kenyan rains. She would reign in the crowd and launch into another song that would fall apart into rambling praise and then back to song. This hysterical madness of praise continued for about an hour and then another man took the mic to talk about grace. At this point I was too consumed with my own thoughts and processing of the experience to pay much attention to him. He went on for awhile and we finally left as he was finishing up at 12:30. Angela said that it would be a 4 to 5 hour service. Thankfully we got out early. Then it was off to her house for lunch. There we hung out, watched some music videos and ate a great meal. She made the best cabbage I have ever had. The majority of the entertainment was provided by her son Gracious. He was scared of us initially, except for Sue the child whisperer. He came around after a bit and went around teasing everyone. He would burst into laughter when Sue would give him a look, fall in hysterics when she would bang her hands on the table. Then it was back home to relax and watch some more bootleg movies. Great buy on Michael's part by the way. Now the thunder is roaring and the rain is about to start. Yesterday's shower was much needed. Ah, and since I did not mention this, rain here is perfect for a shower. Since I was already soaked from the walk home from the soccer match, I decided to put on a pair of shorts and grab my shampoo. I lathered up and rinsed off in the rain. Since we did not have a shower ready for the day to save water, it was a treat to have a shower in the rain. Not a perfect shower, but refreshing and needed. Maybe I will develop a rain shower system to help preserve water. It is a bit cold, but nice as you get used to it. A new week begins and tomorrow my corned beef cooking will take place. When the rain falls, we run and hide.. It poured for an extended period this afternoon. Cat and dog type rain is not even applicable to the downpour that beat against our home. It happened to start as I was at the I-Max Theatre watching Man U fall to Liverpool. Neto told me that the match was today and invited me to join in watching it. I arrived ahead of him and walked into a dark room with a television showing the pre-game show behind bars. I hesitated and stayed in the back, but then moved forward to find a seat amongst the wooden pews. Someone called out to me and moved over for me to sit down. He was not Neto, but I was not going to complain about being given a seat. Neto showed up shortly after and sat on the other side of the aisle. I think even before he sat he launched into his great Man U speech. I, of course, was cheering for Liverpool because a win or tie by them would aid Chelsea. The men in front of me asked me about who I was behind in the match and then asked me to reconsider my decision to support Liverpool. I always thought sport can bring a bunch of men together, but I did see it action today. Before the match, everyone around wanted to know my opinions and who were my favorite players. It is nice to have a conversation about sports. I do miss that. Neto and I get into it every day, but it is different to be in a packed room with a bunch of people yelling at a television. There is something relaxing about this atmosphere. For 40 bob (bob meaning only but used in place of Shillings), I watched the satellite feed of Liverpool thrashing Man U at Man U's home stadium. Everyone joined together in hating Man U and went crazy for each of the four Liverpool goals. I think that I sometimes need something to root for. Something to get behind and support for no thought or reason. To experience joy and agony in a two hour period that is both fleeting and raw. Packed in a hot room with no windows, we were all together watching sport. The heat was terrible but forgotten with the action of the match before us. Each goal was an exercise in happiness. After a tougher week, this was the prefect remedy to all my concerns. Tomorrow the blues will be playing and I may go and catch the match. I will definitely continue to see matches. Going today gave the best escape. One that I thought I did not need, but realized had to have. Earlier, all four of us went to Kakamega. Michael and I split off to go to the bank and hit the MPSEA store. When we arrived to put money on our MPESA accounts I realized that my phone had dropped out of my pocket. That meant that I had to buy a new one and get a new sim card. Fortunately, it is really easy to make a switch. I retain my phone number and money on MPESA. The only losses are the money, my phone, and numbers on it. I bought the cheapest phone possible with the thought that if I lose it, that I would not be mad. All in all, it was not much of an issue. I got the phone right away and it only cost me about $30 for a new phone and card. We sat down to a breakfast of eggs, bacon, sausage and toast. In small portions of course, but a nice throw back to diners from home. We did our shopping and then I met up with Jean and Sue at the pool. I ate lunch with them and took the best matatu ride ever home. I had a front seat and the first stop was my stop in Malava. That meant a fast ride in the best seat. Front seat of the matatu is great and getting home quickly was wonderful. Then it was off to the soccer match and now back home to watch some bootleg films Michael bought. A great day to say the least and an end to a strange week. Tomorrow we are going to church with Angela and then over to her place for lunch. The mass will be in English, a bonus, and is supposedly very lively. If it lives up to Angela's hype, I am sure that I will have lots to say about it tomorrow. I used the same title for Sunday, but today was really a Sue-filled day. In the morning she gave me a call to confirm a trip to good old Honey Drop. She got to meet Honey Drop girl (she wore a dress the other day so I assume is not a girl despite the fact that some parents will put dresses on boys). We watched a little morning news, some CNN and relaxed on our day off. Phyllis called and we had a very productive chat at 9:30. It was good to be able to express all my frustrations. It was helpful to talk with an outside person who could offer advice from a different point of view. Talking things over has made me feel a lot better. It looks like some things may be changing that will make things better. I will not say too much because things have to make their way up the chain and there is still much to go over, but I am in a far better mood than I was on Wednesday. Sue and I continued to hang out for the afternoon, read the paper, discussed Aprils trip and our upcoming birthdays. Then it was time to head over for chicken and chapatti. Sadly, there was no chapatti to have. So ugali it was. Now, I am winding down and preparing for dinner. It keeps getting darker and darker at an earlier hour each day, but not much rain. The rainy season is supposed to have already started, but Michael and I have our doubts concerning this whole season of raining thing. Tomorrow will be big day in Kakamega. We will do a bit of shopping, see the bigger market and maybe go to the pool. March is flying by and according to Michael we have broken the 20% done threshold. I still feel as we just got here, so I don't think that doing this four more time should be too much of a problem. Sleep continues to be a minor issue. I did discover that my net had fallen down and was not preventing bugs from entering my bedroom. Most of my problem has been due to larger bugs flying in the window and battering themselves into the walls. With that problem fixed today, I think tonight should be a good sleep. Fortunately, the weekend is when I get my best sleep. It is also when I stay up the latest, so my problem could also be resting in going to bed too early. Last night I was up to eleven and there was an improvement from the previous few nights. A bad nights sleep can catch up to you quickly in this heat. Don't forget that HC is playing today for a birth into the big dance! Go Saders! I got days confused, but better late than never! HC plays for the PL title tomorrow on lucky Friday the 13th. It will be on ESPN2. Whoever texts or emails me the score will be my best friend until the next contest!